Two Sisters From The Right: Of Course It's A Ponzi Scheme! We are frequently hearing that Governor Rick Perry called the Social Security Administration a Ponzi scheme. Those of us who have not been closely engaged in the world of finance, (we do know about household budgeting) have learned new terminology and concepts in the last few years, especially since Obama took office. As Liberal Arts majors - English and Foreign Languages, we Two Sisters were more concerned with literature than with numbers. Is it any wonder then that when terms like Ponzi scheme and Keynesian economics were bandied about we ran to our search engines looking for definitions? One journalist whose intelligence, integrity and writing we respect is Dr. Charles Krauthammer. He has written an easily understood article, appearing on The National Review Online, which explains in layman's terms how Social Security is a Ponzi scheme. We know that many of our readers are concerned about the fate of the Social Security system, as are we retirees. Some more than others are very reluctant to accept change. How often do we hear, "If it ain't broke, don't fix it! ? Well we've read enough to know that the system is indeed in need of repair. Proposition 1: In a Ponzi scheme, the people who invest early get their money out with dividends. But these dividends don’t come from any profitable or productive activity — they consist entirely of money paid in by later participants. This cannot go on forever because at some point there just aren’t enough new investors to support the earlier entrants. Word gets around that there are no profits, just money transferred from new to old. The merry-go-round stops, the scheme collapses, and the remaining investors lose everything. 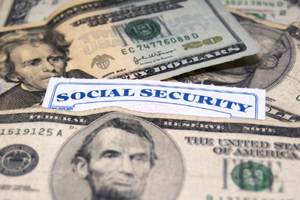 Now, Social Security is a pay-as-you-go program. A current beneficiary isn’t receiving the money she paid in years ago. That money is gone. It went to her parents’ Social Security check. The money in her check is coming from her son’s FICA tax today — i.e., her “investment” was paid out years ago to earlier entrants in the system and her current benefits are coming from the “investment” of the new entrants into the system. Pay-as-you-go is the definition of a Ponzi scheme. So what’s the difference? Ponzi schemes are illegal, suggested one of my colleagues on Inside Washington. But this is perfectly irrelevant. Imagine that Charles Ponzi had lived not in Boston but in the lesser parts of Papua New Guinea where the securities and fraud laws were, shall we say, less developed. He runs his same scheme among the locals — give me (“invest”) one goat today, I’ll give (“return”) you two after six full moons — but escapes any legal sanction. Is his legal enterprise any less a Ponzi scheme? Of course not. That’s why Ponzi schemes always collapse and Social Security has not. When it’s mandatory, you’ve ensured an endless supply of new participants. Indeed, if Charles Ponzi had had the benefit of the law forcing people into his scheme, he’d still be going strong — and a perfect candidate for commissioner of the Social Security Administration. But there’s a catch. Compulsion allows sustainability; it does not guarantee it. Hence . . .
You can force young people into Social Security, but if there just aren’t enough young people in existence to support current beneficiaries, the system will collapse anyway. When Social Security began making monthly distributions in 1940, there were 160 workers for every senior receiving benefits. In 1950, there were 16.5; today, three; in 20 years, there will be but two. Now, the average senior receives in Social Security about a third of what the average worker makes. Applying that ratio retroactively, this means that in 1940, the average worker had to pay only 0.2 percent of his salary to sustain the older folks of his time; in 1950, 2 percent; today, 11 percent; in 20 years, 17 percent. This is a staggering sum, considering that it is apart from all the other taxes he pays to sustain other functions of government, such as Medicare, whose costs are exploding. The Treasury already steps in and borrows the money required to cover the gap between what workers pay into Social Security and what seniors take out. When young people were plentiful, Social Security produced a surplus. Starting now and for decades to come, it will add to the deficit, increasingly so as the population ages. Demography is destiny. Which leads directly to Proposition 4: This is one Ponzi scheme that can be saved by adapting to the new demographics. Three easy steps: Change the cost-of-living measure, means test for richer recipients, and, most important, raise the retirement age. The current retirement age is an absurd anachronism. Bismarck arbitrarily chose 70 when he created social insurance in 1889. Clever guy: Life expectancy at the time was under 50.